When we open the door to darkness we welcome this darkness into our lives and into the lives of those closest to us. Once this door is opened there is a force of evil that will beckons us to step into it’s shadows! The darkness will entices us with it’s lies and tempt us with elaborate yet empty promises. The darkness wishes to blind us to our purpose! It desires to cloak our souls and distract us from all Light. Consumed by the darkness we try to find our way yet we stumble and fall again and again, each time suffering injuries greater than the last… confused by how we got here and blinded as to where to go! If we pause for a moment in our darkest hour, pray to see the Light and cry out for help on where to go there is no doubt our prayers will be answered. The Light of love will shine in on us once again and lead us home. After spending time in darkness our eyes may become sensitive to light! We must not confuse this with more suffering! 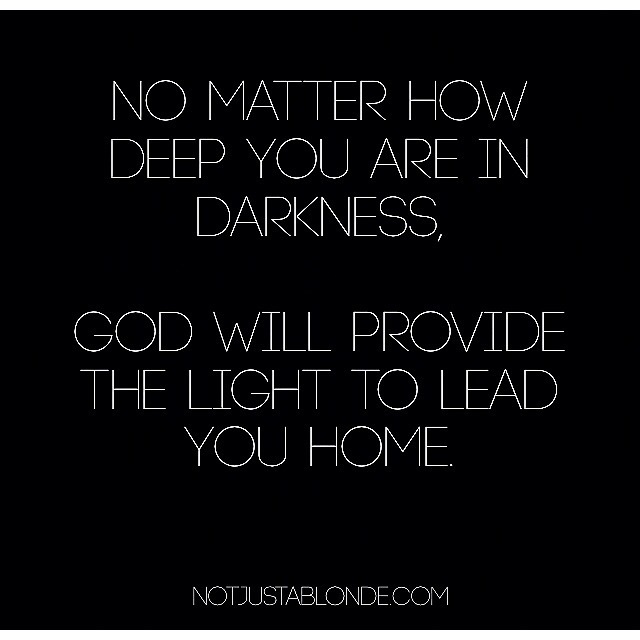 We often must walk through the darkness towards the light that shines brightly… and must not be afraid! “Fear not”… some of the most loving words to have been said. We each have nothing to fear if we focus on the light. Darkness is made of fear but light is made of Love. It takes only a little bit of Love to dispel a whole lot of darkness. If caught up in darkness, close your eyes and breathe a prayer… send out a call to Light, to Love, to God and you will be expelled from the shadows and welcomed with utter joy back into the Light… back to your path of purpose… and into the arms of Love! John 1:5 (NIV) ~ The light shines in the darkness, and the darkness has not overcome it. Isaiah 41:10 (NIV) ~ So do not fear, for I am with you; do not be dismayed, for I am your God. I will strengthen you and help you; I will uphold you with my righteous right hand. Joshua 1:9 (NLT) ~ This is my command—be strong and courageous! Do not be afraid or discouraged. For the Lord your God is with you wherever you go. Psalm 34:4 (NLT) ~ I prayed to the Lord, and he answered me. He freed me from all my fears.